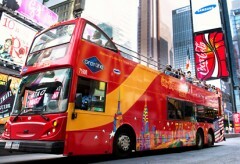 Get access to the best of the Big Apple with the official CitySightseeing All Around Town Bus Tour. Explore New York City’s most spectacular neighborhoods – Uptown and Downtown Manhattan, Harlem, Brooklyn and everything in between, with experienced tour guides who will delight you with fun and factual stories of this magical city. Whether you choose to take it all in from the comfort of a double-decker bus, or hop off at every stop to explore, the All-Around Town Bus tour is the best deal going! With routes that pass all the must-see attractions -- like Times Square, the Brooklyn Bridge, Central Park, Rockefeller Center, the Guggenheim, and more -- you’re sure to get the full New York City experience. Whether you’re in town for 24 hours or 5 days, this bus pass will take you everywhere you want to go. No need for cabs or the subway – this is a tour and transportation all in one! Hop on board the CitySightseeing Ferry Tour and explore New York City and its famed waterways. This contemporary ferry boat has ample outdoor decks and a climate-controlled interior to keep you comfortable no matter what the weather. Your 90-minute tour is packed with stunning views of the NYC skyline and the city’s most iconic landmarks, including the Statue of Liberty. Easy connection from the Downtown Bus loop and two hop-off stops make this a great option for both sightseeing and exploring the Battery neighborhood. In “the city that never sleeps,” some of the most spectacular views don’t happen until dark. This fully-narrated bus tour will take you to the best spots for viewing the twinkling lights of the famed New York City skyline. This CitySightseeing tour is a customer favorite you won’t want to miss! • New York Historical Society and Museum -- A trip to New York wouldn't be complete without a visit to the New-York Historical Society and Museum. 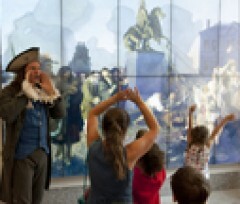 Quirky, smart, immersive and boasting the only Children’s History Museum in the area, this museum hits the spot if you’re craving a quick and surprising bite of NYC culture. Located across the street from beautiful Central Park, it offers a rich taste of the city in about an hour. *The Free Museum ticket is only valid for EITHER entrance to the Museum of the City of New York OR New York Historical Society. All Around Town Tour + 1 Attraction: Add an attraction ticket to the All Around Town 48 or 72-Hour Tour. Get access to all loops PLUS your choice of admission to one included attraction. This is a great choice to save money if you plan on visiting a museum or attraction during your visit! No need to choose which attraction to visit now. FreeStyle Pass - If you know you’ll want to do several tours and attractions while in New York City, this is the pass for you! You’ll get the All Around Town 72-hour Bus Tour PLUS your choice of admission to 3, 5 or 7 attractions. This is a great option for money savings and convenience. With more than 55 included attractions to choose from, you can build your own experience and save as much as 40% when compared to buying these tickets individually! Tour lengths vary based on the route and range between 90 minutes and 3 hours. Please see the “Ticket Includes” tab above for details. Times vary by tour loop. Please refer to each tour description under “Ticket Includes” for specific times. Generally, buses run continuously every 25-30 minutes. After you complete your online purchase, you will be redirected to a page with your pass. Additionally, an order confirmation with a link to your online pass will be emailed to you within two hours. You will redeem this pass for a bus ticket at any of the visitor center locations listed. You may show your online pass on a mobile device or bring a printed copy. Please bring valid identification. Once you’ve redeemed your pass for the bus ticket, you can start your tour and hop on or off at any designated stop. Depending on which duration you choose, the All Around Town tickets are valid for either 24, 48, 72, 96 or 120 consecutive hours from the first time they are scanned on the bus. This consecutive time-frame includes all bus loops, the Night Tour, CitySightseeing Hop-on, Hop-off Ferry and the bonus museum admission choice included as part of the All Around Town Tour.